ImaginArte was an exciting interdisciplinary humanities project that drew on CEMA collections to foment new research, scholarship, exhibitions and publications. Its overall goal is to support new scholarship, research, exhibitions, publications, and greater online access to the visual legacy of the Chicano movement. The project ran from 2007 - 2011 and continues to make available the digital resources on this website. This project was a multi-institutional campus partnership involving four campus institutions: the Center for Chicano Studies, the UCSB Library's California Ethnic and Multicultural Archives (CEMA), the University Art Museum, and the Department of Chicana and Chicano Studies. The project aimed to benefit and enhance the reach of each of the collaborators. This will be of value to not only scholars, educators, and college students. It also will provide unique information resources that will be useful to public teachers and their students in K-16 school settings. 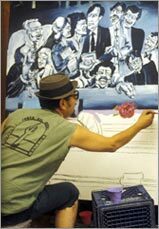 The development team for ImaginArte was the UCSB Research Working Group on Chicano Visual Arts, under the auspices of the Center for Chicano Studies. Project directors Dr. Maria Herrera-Sobek and Sal Güereña state that ImaginArte exploits CEMA's strong holdings in Chicana/o visual arts to promote scholarly inquiry and analyses. The project has produced new interpretive texts, an exhibition, streaming videos, an oral history book and e-scholarship. In addition, the project has provided improved documentation and contextualization of visual arts materials in the CEMA collections. First, the project featured visiting artists in residency. 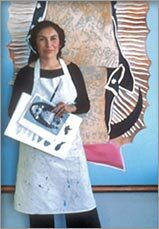 These are artists whose papers are housed in CEMA. These have included Yolanda Lopez, Estaban Villa, Salvador Torres and Diane Gamboa. Rounding out the visiting artist series was Hector Gonzalez. The artists in residence performed documentation work on their respective collections, assisting guest curators with planning exhibitions of their work. They also gave public lectures and classroom presentations, and/or wrote interpretive texts to be published through the project.